‘Chutney’ is a word adopted into English from a Hindi term meaning ‘to lick’; a fitting epithet for a category of condiments that add so much relish to the foodstuff to which they’re applied. 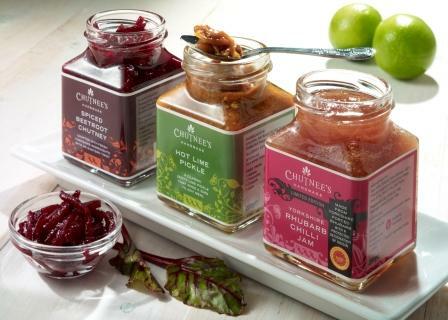 In the UK, ‘chutney’ is almost always applied to long-simmered, vinegar-laced and sugary-sweet stuff. But India’s classification of the category is rather broader. Chutneys can be fresh, zesty preparations; down South, often based on ground-down dal, ginger, peanuts, or fresh coconut flesh. Then there’s the India-wide, ubiquitous green chutney – a herbaceous paste that will call to mind a particularly zippy pesto without the oil. In South India, they’re served with snack foods like idlis and dosa; whilst Delhi‘s innumerable street chaats would be incomplete without either verdant splashes of green chutney or the sweet-sour tang of runny, ketchup-like tamarind and date chutney. Certain chutneys may appear all over India, but their flavours will vary not just from state to state or home to home, but also from person to person. Bengal‘s chutneys are rather unique; sweet, jam-like preserves flavoured with the five seed spice blend called panch phoron; the closest cousins to the sweet mango gloop curryhouses coerce you to consume alongside a stack of poppadoms before a meal. But in Bengali homes, preserve-laden pappads are eaten post-prandially as an after-dinner treat to please the typically sweet-loving palate. North Indian murabbas are similarly saccharine – essentially the Indian answer to Middle Eastern spoon sweets, featuring pieces of fruits, vegetables or even flower petals preserved in thick sugar syrup. Prefer piquant? Indian pickles are often oily, tart, tangy, salty and sour. They might include amla (Indian gooseberry), green mango, Indian olives, garlic, chilli, carrots, or any one of a million and one other ingredients; or indeed, as with the famous Achar Pachranga pickle, a marvellous melange. They also are not exclusively vegetarian. Just a little of a meat- or fish-based preparation is sufficient to add savour to a mountain of rice. Goa’s Portuguese-influenced balchao or even the original vindalho are examples, their high volumes of vinegar acting as an excellent preservative in the days prior to refrigeration. You can even try dry chutneys – ‘podi’ powders that are mixed with a little oil or ghee and used to make snacks even more lip-smacking. ‘Gunpowder’ is one such offering, its name explaining its explosive effect. Similarly spiky is the Bengali mustard-based sauce, kasundi – a must for fans of sinus-clearing Colman’s. Anjum Anand’s ‘Chutni’ range features some unusual specimens and, unusually for shelf-stable attempts, items like the Andhra Pradeshi peanut and tamarind retain their vibrancy. Recipes are regionally-inspired and authentic – the range includes a lime and chilli pickle that’s a favourite of Anjum’s husband’s family, and a sweet green papaya chutney commonly called ‘plastic chutney’ owing to the crystal clear appearance of the paper-thin papaya. The tin or tub looks terrific in the kitchen, and the oily, tart, salty savour of what’s within lifts any and every meal. 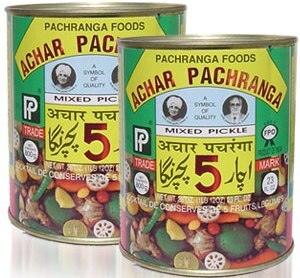 Found in most Indian supermarkets, Achar Pachranga is a rich mix of mango, lemon, lotus root, turnip, karonda berries, carrot, tenti dehla (aka ‘snotty gobbles’ in colloquial English! ), and ginger root; hot with whole chillies and further flavoured with several spices. 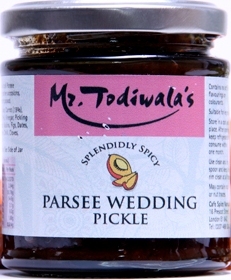 The whole range of ‘Mr Todiwala’s Splendidly Spicy and Deliciously Hot Pickles and Chutneys’ is worth relishing, and many are eye-opening and unusual to boot. The preservative-free preparations are packed with carefully-sourced ingredients including game and seafood. Try them all, but first try the prawn, venison, and wild boar vindaloo pickles, the beetroot chutney, and the exquisite carrot-and-dried-fruit Parsi wedding pickle. Pratap Chahal wants to encourage experimentation amongst Indian food fans and get them relishing regional recipes. 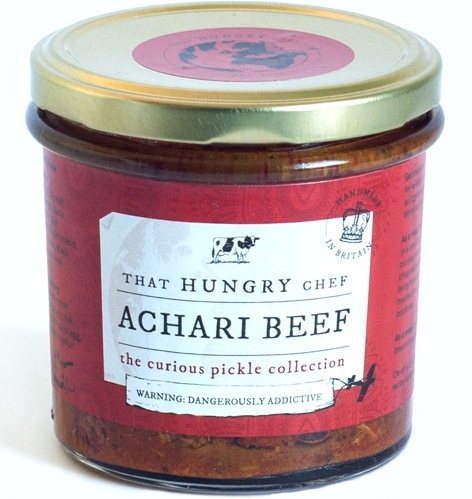 Three tongue-tingling ‘Mojo Risin” chilli relishes are perfect for fans of fire AND flavour, whilst the Achari Beef and Pork Vindaloo ‘Curious Pickles’ can be pressed into service as a sandwich spread, a cheese condiment, or even a concentrated curry base to be let down with coconut milk. 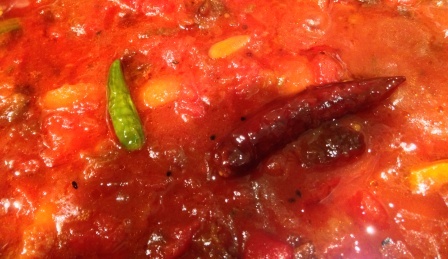 As you’d rightfully expect from cookery school owners with a strong commitment to both using and showcasing local, quality produce, Curry Cuisine chutneys are cracking. Indian-spiced Yorkshire plum and Beetroot chutneys are beautiful, and tart Yorkshire rhubarb varieties similarly splendid – the latter available in either a single-fruit version or paired with sweet, fruity mango. 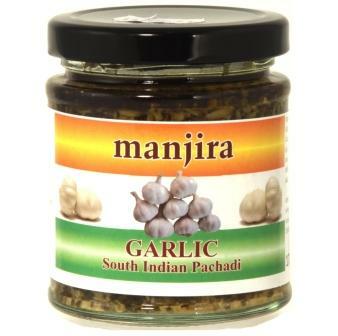 The long-established Anglo-Indian condiment company might not make a meal of creating cracking chutneys, pickles and sauces, but all those products have no doubt been the making of many a meal. Hot Indian apple pickle, exemplary brinjal pickle, and an unusual sweet, light lime chutney are my recommended relishes, but there’s nothing in this range that will fall short of satisfying. 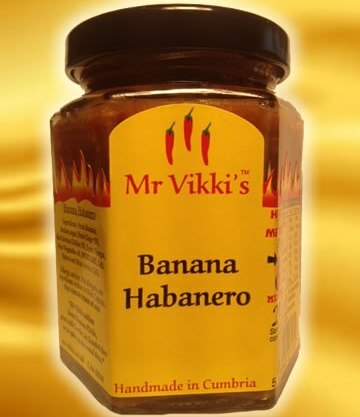 Mr Vikki’s condiment collection is consistently excellent, but the banana-habanero chutney is especially noteworthy. Habanero’s heat is fruity by nature, snuggling up sweetly with ripe banana and additional aromatics to award-winning effect. The recipe took a full four years to perfect, and it was worth every one. 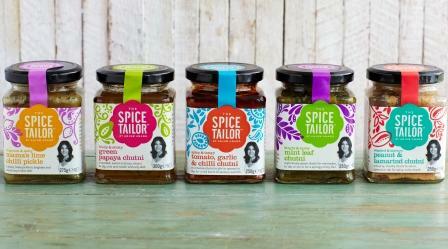 Hot tamarind chutney and East India relish are also extremely edible. These pachadis are curious condiments – deeply savoury, dairy-, sugar-, and vinegar-free, pleasantly pesto-like in their oiliness. It’s none-too common to come across this kind of curious condiments,and what’s more, it’s far too hard to choose a favourite. All five flavours sing strongly of exactly what they are, so simply opt for one of each type: Garlic, Ginger, Tomato, Onion, and Tamarind. 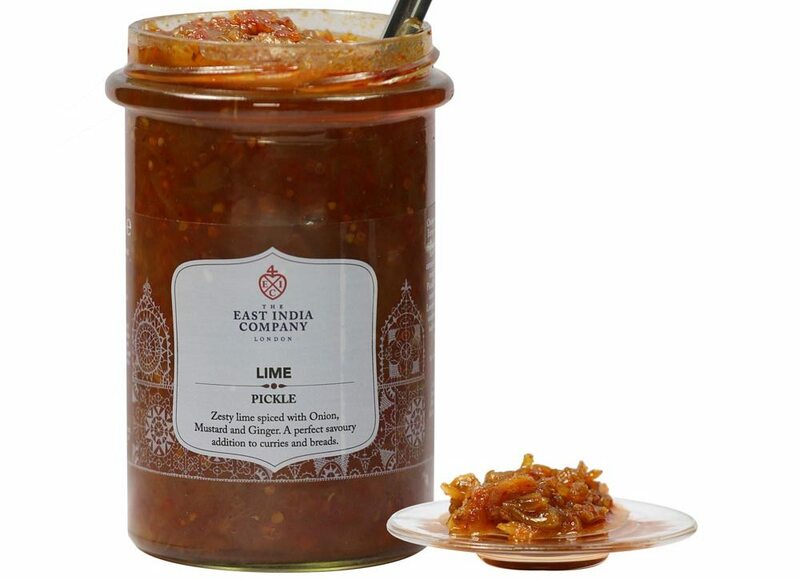 There is nothing The East India Company makes that I would not happily take into a corner in the manner of Little Jack Horner, but this lime pickle chutney is a firm favourite. Miles away from the commercial ‘instant heartburn in a jar’ stuff, this is warm with ginger, boasts the piquant addition of mustard, and is full of fresh lime whose flavour is at once zingy and musky. V. good. 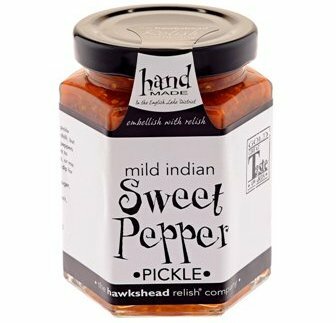 Aside from a much-mourned prawn pickle, Hawkshead’s Sweet pepper pickle is my pick from this all-encompassing relish range. 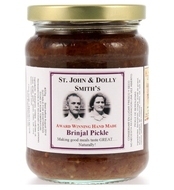 The award-winning condiment combines selected spices and sweet capsicums, but leaves out the chilli – providing the perfect pickle for people who love Indian food but can’t stand the heat. It’s styled as a condiment but mellow enough to eat solo by the spoonful.